Digital health strategies, such as eHealth and social media, offer multiple platforms to actively engage families in discussion and activities with one another and the clinical team. CPCE's treatment adherence research studies both these applications to determine their potential to increase patient treatment adherence, as well as their potential to cause harm from data shared in social media. We are using a range of methods, including qualitative, informatics, and natural language processing (or text mining), as well as clinical trials. For this project, we study the patterns of use of controller medications for children with high risk, urban asthma in order to implement timely interventions that target the causes of lapsed patterns of controller medication use. Prior studies estimate average rates of adherence with prescribed controller regimens to be approximately 50 percent. Rates are lower in urban minority children, but average rates don’t provide information on how children take their medication over time and when and why these behaviors may change. Using electronic medication monitoring and group-based modeling, we mapped trajectories of medication use over time to find common patterns. We found distinct patterns of medication use (lapsed, periodic, sustained) among children with the highest ED and hospital use in a local Medicaid managed care population. In a feasibility study, asthma control scores improved over 3 months of an intervention involving outreach by a community health worker that was triggered by electronic adherence alerts. A follow-up study is underway evaluating adherence to controller medications in the months following asthma hospitalization and the efficacy of text-messaging based reminder system in enhancing adherence. Please contact Chén Kenyon, MD, MSHP, Attending Physician, Assistant Professor of Pediatrics, for more information about this line of research. iAPP: integrating Apps in Pediatric Practice -- Researchers are developing a process to integrate evidence-based and clinically evaluated health apps for families into pediatric care at CHOP in order to improve patient outcomes. Grow2Gether – Researchers are developing a peer-based social media intervention to promote healthy growth from infancy. Mining The Twittersphere -- Researchers are using crowdsourcing techniques on Twitter to solicit and find information about pediatric medication side effects. 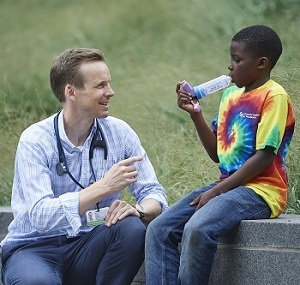 Please contact Alexander Fiks, MD, MSCE, CPCE associate director, associate medical director of the Pediatric Research Consortium, and an Urban Care pediatrician at CHOP, for more information about these research projects. Kenyon CC, Chang J, Wynter SA, Fowler JC, Long J, Bryant-Stephens T. Patterns of Inhaled Corticosteroid Adherence in a High-Risk Urban Asthma Medicaid Cohort. Abstract poster presentation at Pediatric Academic Societies, San Diego, CA. April, 2015. Chang J, Kenyon CC, Wynter SA, Fowler JC, Long J, Bryant-Stephens T. Feasibility and Acceptability of an Electronic Adherence Monitoring Intervention in High-Risk Pediatric Asthma Patients. Abstract poster presentation at Pediatric Academic Societies, San Diego, CA. April, 2015. Gruver RS, Virudachalam S, Gerdes M, Shults J, Suh AW, Bishop CT, Kalra GK, Magge SN, DeRusso PA, Power TJ, Berkowitz RI, Fiks AG. Early Childhood Obesity Prevention: Comparing Mothers' and Clinicians' Priorities. Poster Presentation at the 2014 Annual Meeting of the Eastern Society for Pediatric Research, Philadelphia, Pennsylvania,(Winner of the Best Poster Award), March 2014.